Thought I would participate in Susanna Leonard Hill's Perfect Picture Book Friday again this week. Read this one a week or so ago, and it totally enchanted me (and taught me something too!). Check out more perfect picture books here - and this week's new ones on Susanna's blog. doesn't like new things at all. 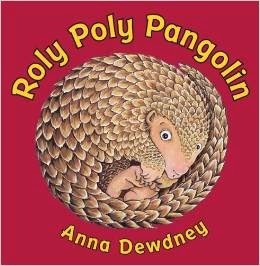 Synopsis: Meet Roly Poly Pangolin: a little pangolin who'd rather stick close to his mama instead of facing anything unfamiliar. Whether it's a line of ants, a friendly monkey, or a loud noise, Roly Poly runs the other way. Then he hears something that really scares him. So he does what all pangolins do when they're frightened: he rolls up into a tiny ball. But Roly Poly is surprised when he finally peeks out, because another ball is peeking back . . . it's a small pangolin just like him! Resources: Here is some info from the author/illustrator on pangolins (an ADORABLE endangered animal), including links, pictures, and facts. Why I love it: The story is absolutely POSITIVELY precious, with gentle, catchy rhymes and delightful meter. The message about fear is so important and sweetly shared. And this creature, that I had NEVER heard of before, is precious, and the illustrations capture it so sweetly. I have fallen in LOVE with Roly Poly. Such a cutie! Those facial expressions are extremely endearing. This is one of God's many artistically designed creatures that has fascinated me. What a great idea for a book. I love the cover. Thanks. Thank YOU, Joanne (love typing that LOL feels funny to thank myself :P) - for stopping by, and for the encourageent. Hope you pick it up - I really enjoyed it! Nice cover, shich would sell me, but I want to check out the preciousness too! Absolutely - the cover was definitely what grabbed my attention. So important! Thanks for stopping by, Julie! Eye-popping cover. Never heard of Pangolin before. Very touching selection. Thanks, Patricia - it was definitely the cover that got it on my to-read list. And I'd never heard of the animal before either. Thanks for stopping by! The cover alone should draw readers in. Exactly, Linda! One VERY fun aspect of picture books that I'm growing to appreciate more and more. Thanks for stopping by, dear friend! You sure don't see many picture books about pangolin!! This is pretty awesome! Thanks for sharing!